happy FRIDAY!!! this week felt sooo slow. i am beyond happy to see that friday is finally here. we had the craziest wind storm this week (justin works in insurance, so he got the bulk end of it), but luckily modest house stayed in one piece. we just have broken twigs & branches galore to pick up this weekend. what are your weekend plans?! 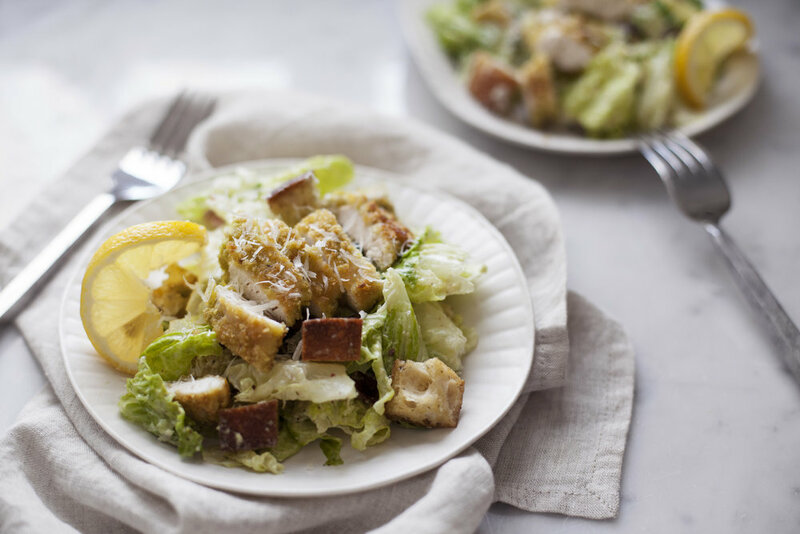 okay, so don't let this long recipe below scare you from making this amazing caesar salad! it is SUPER simple, i promise. i just decided to go all ina garten & make EVERY component from scratch; the dressing, the croutons & the breaded chicken. i even raised the chickens myself! okay just kidding, i am not full barefoot contessa YET, but maybe one day. each of these components relatively uses the same ingredients in one way or another. what you are left with is the ultimate avocado caesar salad! hell, the ultimate salad! seriously, this puts every restaurant salad i have ever been served to shame. the ripe avocado adds a rich & creamy texture to the dressing, i even used avocado mayonnaise. the homemade garlic bread croutons have so much flavour, i just want to eat a bowl of these on their own (i had to stop myself from finishing them before i even assembled the salad for photos). 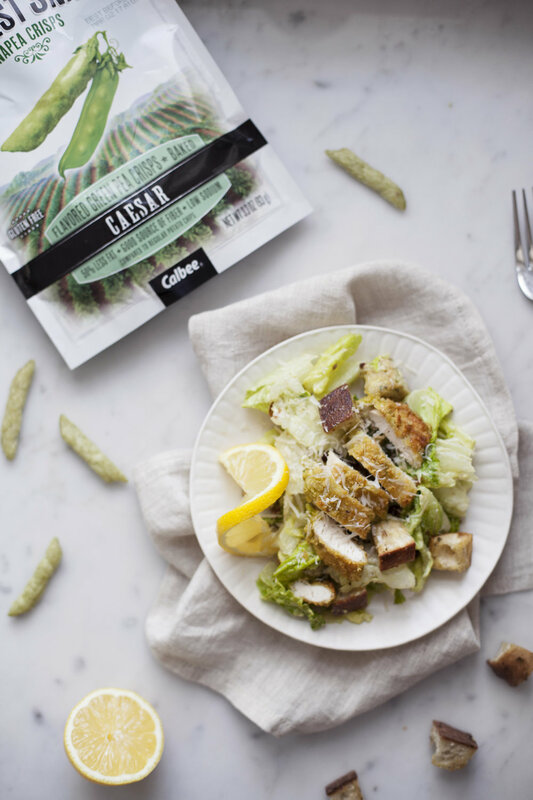 lastly, the chicken strips breaded in crushed harvest snaps' caesar flavoured snap peas instead of bread crumbs adds that extra level of caesar flavour that all the other caesar salads are missing! 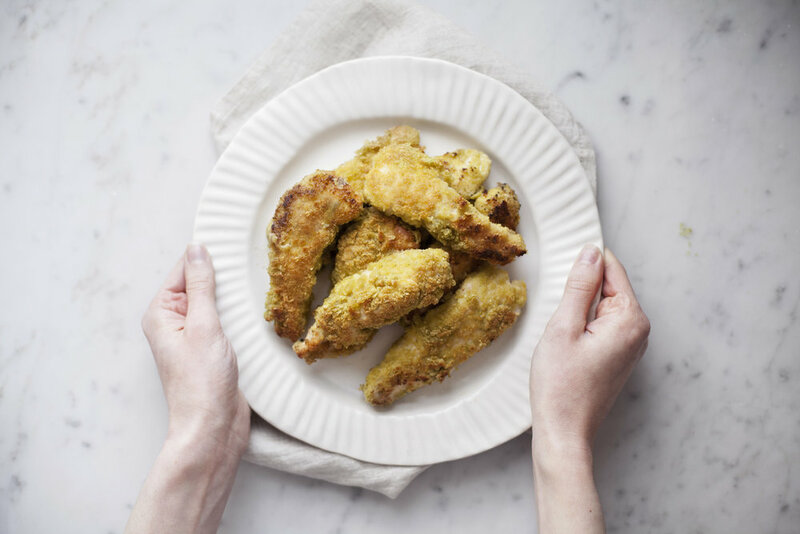 plus it offers a healthier & lighter breading. just wait till late spring & early summer, THIS is the salad you'll want to show up to every BBQ with. NOTE: i do not like anchovies, so i did not include them in the recipe. but feel free to do so if they are your jam! in a large salad bowl add the romaine, garlic bread croutons, crispy bacon & desired amount of dressing. toss until well coated. 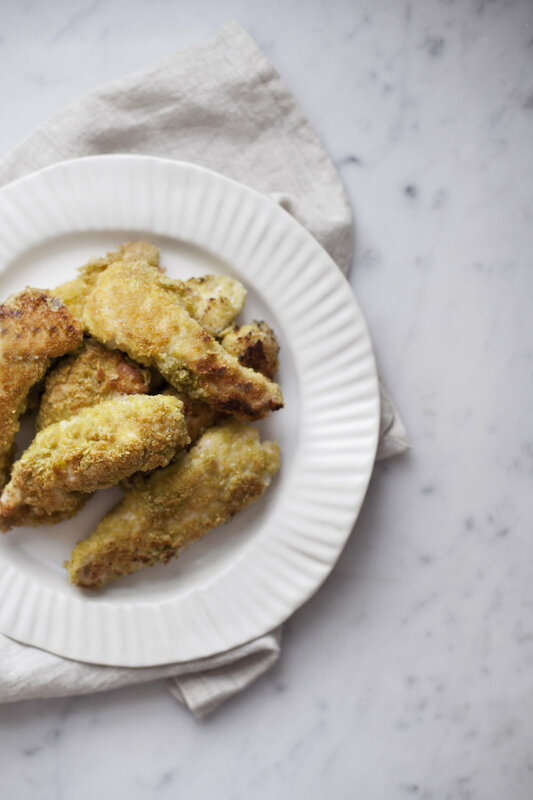 top with sliced lemon & breaded chicken strips. in a large bowl using an immersion blender puree together the avocado, garlic, parmesan cheese, mayonnaise, dijon, lemon juice, salt & pepper until smooth. set a side until you are ready to assemble the salad. dressing will last in the fridge up to one week covered. in a large mixing bowl add the cubed bread followed by the olive oil, parsely, garlic, cheese, salt & pepper. toss well to ensure each piece is well coated. bake at 400 degrees for 10-15 minutes, until golden brown & crunchy! in three large bowls add the eggs in one, the flour in one & the crushed harvest snaps in the other. season each with a touch of salt & pepper. gently toss the chicken in the flour, followed by the egg, followed by the harvest snaps. repeat this step until each chicken strip is coated. in a pan over medium high heat add the oil. once hot fry each chicken strip on each side & place on a baking sheet. finish off in the oven until the chicken is fully cooked, about ten minutes. assemble salad while the chicken bakes!